A couple years down the line, I would love to see Babylon 5 get some re-done CGI, like Star Trek. The CGI in B5 was really good for it's time. But, if it were to receive some overhauls, it would be amazing. There were some problems with the CGI being recorded in 4x3, and the actual show being filmed in 16x9. Those problems could be fixed. daveeb wrote: A couple years down the line, I would love to see Babylon 5 get some re-done CGI, like Star Trek. The CGI in B5 was really good for it's time. But, if it were to receive some overhauls, it would be amazing. There were some problems with the CGI being recorded in 4x3, and the actual show being filmed in 16x9. Those problems could be fixed. I'm not trying to be rude, but B5's effects were bad, even for its time. It was concurrent with DS9 and DS9 was years ahead of it. B5 looked like a little animation someone did on their home PC. It was one of the reasons people turned off on it after seeing an episode or two. Yeah, the graphics weren't great, but that's probably due to the fact it was done on a fraction on DS9's budget. Besides, B5 blew DS9 out of the water altogether in terms of plot quality. Rochey wrote: Yeah, the graphics weren't great, but that's probably due to the fact it was done on a fraction on DS9's budget. Besides, B5 blew DS9 out of the water altogether in terms of plot quality. I don't disagree. But those are the shallow factors on which most people tune in or tune out. Lots of people loved DS9 and never liked any other Trek. Why? Special effects and action, had nothing to do with liking Trek per se. True. A shame, really. B5 surpasses most other sci-fi out there in terms of quality. A lot of people are missing a great show. I never liked DS9's explosions. They seemed to fake to me. B5's explosions seemed more genuine. The best thing that could be done for B5 is syndication. Keep Babylon 5 alive for newer viewers. You never know, but it could gain fans like Star Trek did in syndication. I think the problem with syndication is to some degree you lose creative control. Whereas J.... Stra.... long Polish name guy who wrote B-5 had the entire story, in painful detail, mapped and written years before the show got produced, and he wanted it just so. B5 did lead the way in CGI to a large extent. B5 was all CGI years before Trek went that way. In fact Foundation Imaging was largely built on B5 money, and then ditched them to go do Voyager. JMS was *pissed*. Early B5 did suffer from not-great effects, but I thought they were eminently watchable by about season 3. Not state of the art maybe, but certainly enough to carry along my suspension of disbelief. GrahamKennedy wrote: B5 did lead the way in CGI to a large extent. B5 was all CGI years before Trek went that way. In fact Foundation Imaging was largely built on B5 money, and then ditched them to go do Voyager. JMS was *pissed*. There is quite a bit of beef between B5 and Star Trek. In fact I heard that while they were hemming and hawwing on picking up B5, Paramount ran off with the idea of basing a Trek on a space station after hearing about JMS's idea. No clue if that's true or not, but I've been hearing it for years. Every time I hear something about that, I get a headache. Every time I see a Defiant vs. White Star argument, I get a headache. It's just torture. I can confirm one thing, though: The reason why General Hague was not on B5's "Severed Dreams" was because he was on DS9 instead. Agent double-booked him. It's brought up on a blooper reel. I think Syndication would be good for B5. 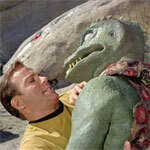 It saved Trek and its saving a lot of older shows from going into history. If they redid the special effects on top of that I think it would gain a fairly good fanbase. I'm surprised Sci-Fi or Spike TV isn't showing reruns of it. I don't know if I would go that far. I LOVED both, but it may never be possible for me to really compare them. A lot of what made DS9 interesting was that it WAS the Trek universe, so things like the Federation's desparation gets particularly interesting having watched TOS and TNG. It's hard to tell for me. I think they're pretty different shows. I think Londo and G'Kar were great characters. But so was Gul Dukat. The biggest advantage I can think of that the former had involves the fact that, eventually, I think we were supposed to recognize Dukat as "pure evil," as Sisko put it. Of course, I haven't watched that in a while so I could be wrong. What do you guys think? I don't think they can be compared. They are both wildly different in my opinion. DS9 showed that the glittery, all so perfect Trek world had its crapness, and it came hard and heavy. It made trek real in a way. B5 had no reference. it was a gloomy look from the start. And it's stories and acting were top notch. DS9 was built around Trek. There were pre made races and nations to play off of. Then just add one or two more and you have a story. A couple of neat space battles and new baddies. What made it such a boom for Trek was it was the first time Trek had a story line. B5 was its own Universe. No prefab parts, no where to draw from. B5 wasn't important because it was Human or Federation. It was Important because of the people who were there. B5 was a character built show that had FX for a little bonus.